Media FHE HEi News Weekly HE news review: Storm clouds gathering? 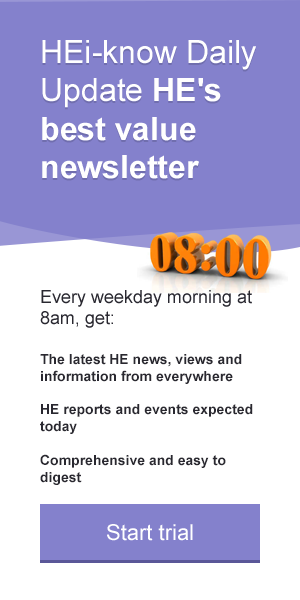 You are here: Home > HEi Know > HEi News > Weekly HE news review: Storm clouds gathering? In a week where the main news focus was the meaningful vote, the rejection of the EU Withdrawal Agreement and speculation as to where this leaves the UK, it would be easy to focus on Brexit. You don’t have to go too far to find dire warnings of the consequences for the sector and the Business Times has the latest summary of a perfect storm facing HE. It’s reasonable to say that on Brexit we know no more now than we did last week about what this means for our longer term future and keeping a close, informed eye on developments while planning for the worst seems a sensible approach whether that means preparing for no-deal or proactively building post-Brexit relationships with the EU. This week’s round of speculation around the possible outcomes of the Augar Review continued to focus on likely recommendations on fees and loans with articles on the potential implications for students and institutions featuring in the FT, Guardian and BBC. However, what little of the commentary has considered thus far is that the devil is unlikely to be in the detail of the Augar recommendations. What Browne, Dearing and other higher education reviews over the years show is just how far the reality of Government implementation varies from the original recommendations. The kite-flying is fun to watch but it will be what Government does with the Augar Report that really matters. With Westminster focussed on English HE policymaking and apparent leaks from Augar, it’s interesting to see stories on similar challenges facing HE in Scotland where College lecturers are striking over pay and the Education Secretary, John Swinney, has rejected Universities Scotland’s argument that ongoing real term cuts are unsustainable. He suggested that the sector is good at finding new sources of income itself and rebuffed the argument that a sustainable level of core government funding is essential for the staff and facilities that enable universities to compete for these resources. Brexit aside, this week has seen some new and interesting developments in the UK higher education story. The debate around unconditional offers took a week off as discussion moved to the familiar refrain of the potential for post-qualification admissions, this time reimagined in a UCU report. The report presents a vision of higher education admissions as a student-centred process which supports decision making across all options including apprenticeships and employment. This was balanced by a HEPI blog which reports that a quarter of school exam grades are wrong so whatever the process for admissions there is evidence of subject areas where grades may be a less reliable indication of an applicants’ ability. A word of sense also emerged on the degree inflation debate as Phil Pilkington, writing for WonkHE, explored the possible academic causes beyond the negative headlines. In the context of earlier coverage, it seems that degree inflation will continue to be used in the media as a lightning rod for a wider narrative around marketisation, value for money and the qualities of a degree. But understanding the causes of the change and where it sits in wider HE policymaking, rather than relying on simplistic assumptions that degree inflation is just a bad thing, offers a new way of thinking about the issue. Finally, there was a lovely story on an early display version of the periodic table being found underneath a lecture theatre at the University of St Andrews. The article is an interesting counterpart to a recent piece in the Conversation about how the current iconic design emerged.